"This recipe uses a make-ahead mix that can be stored for a couple of weeks. Use 2 cups for this recipe. Add the following ingredients to the mix for Sugar Cookies." Melt butter over low heat and add to 2 cups Basic Cookie Mix. Lightly beat the egg and add to mixture. Stir in vanilla and mix well. With lightly floured hands shape into 1 inch balls and arrange about 2 inches apart on a greased cookie sheet. Bake at 350 degrees F (180 degrees C) for 12 to 15 minutes until golden. Cool a couple of minutes before removing from cookie sheet to racks to complete cooling. 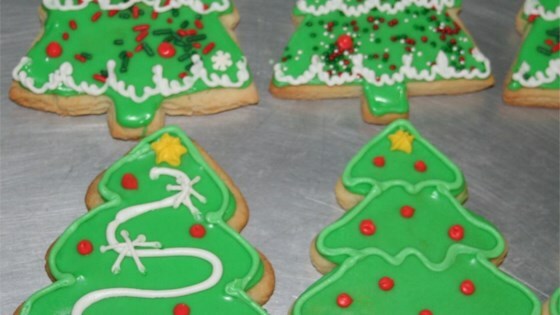 Watch how to make the essential holiday cookie. Click here for the Basic Cookie Mix recipe. These were the first cookies that I've made that turned out tasting like cookies. I will say that next time I am going to chill it for a half an hour to make it less drippy batter. Sprinkle cinnamon on them before you stick them in the oven to give them a bit of extra flavor. I've shown this recipe to several friends and coworkers and they have ALL loved it! I made up the Basic Cookie Mix ahead of time, and this was the easiest way I have found to make ANY cookie. Thank you! these were amazing !! way better than that photo! I used coconut oil in it's solid form and added a little water. they came out sooooo crunchy chewy almost like a carmel bottom ....yum~! I put them in the oven for 8 min, and put sprinkles on them.